Daily Art West: Brand New! This guy's the reason for my lack of posts lately--our new grandson, Grayson Lee Wicks! He was born Wednesday evening and is doing great. Our daughter and son-in-law are exhausted but thrilled. How about that head of hair? We're spending some time here at Grayson's house in Portland, trying to help out and not be in the way. I'll try to do a little painting while we're here and write a post or two. But if you don't hear from me for awhile, blame it on Grayson! Congratulations to all. He is a healthy looking and adorable baby! Congratulations Don- what a little blessing! First grandbabe for you and Brenda? Congratulations to you both... but mostly to the parents, after all. Take a deep breath and catch your zzzs, cuz little Grayson will take most of both from now on! Grayson is beautiful. Best wishes to all. Congratulations to all! What a joyous occasion. Brand-new and beautiful. I bet he's going to be a bright one. He already looks as though he has a question or two for us all. A little masterpiece - enjoy every moment! Let me add my name to the growing list of those offering congratulations to all of you. And I'm jealous of that head of hair! Don, if the family, oops, I mean you need a break, give me a call and I'll show you my studio and we can do lunch. A handsome and sweet baby! Congratulations to everyone and many blessings! Oh well done mum and dad! and welcome to a very interesting world Grayson! Wow Don what a beautiful baby. Congratulations! Yes and welcome to the world Grayson. Thanks, Egretta--he seems very healthy and we're so glad. Our third grandchild, Sam, but the first in 17 years, and the first boy. Thanks for your congrats. Thanks, Shirley. Yes, he does give us some quizzical looks--we must seem very strange to him. Thanks, Rahina. 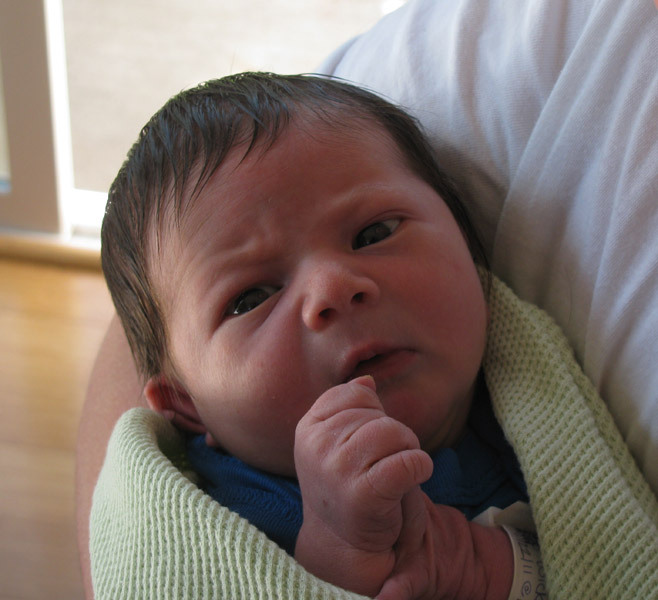 Amazing how newborn's expressions seem to carry a deeper wisdom, somehow, don't they? Hi Erika--thank you! I'll bet Grayson will show up in some paintings, and pairing him with Winslow would be great fun. thank you, Claire--we are loving it! Thanks a lot, Gary--would love to meet you. I'll drop you a note. Thanks, Chris, for your nice note. Good to hear from you Sheila--thank you! Hi Katherine--thank you! We're so thrilled to have Grayson here! Congratulations! He's very cute. Funny, he looks older to me than a newborn.